I told you it was coming. 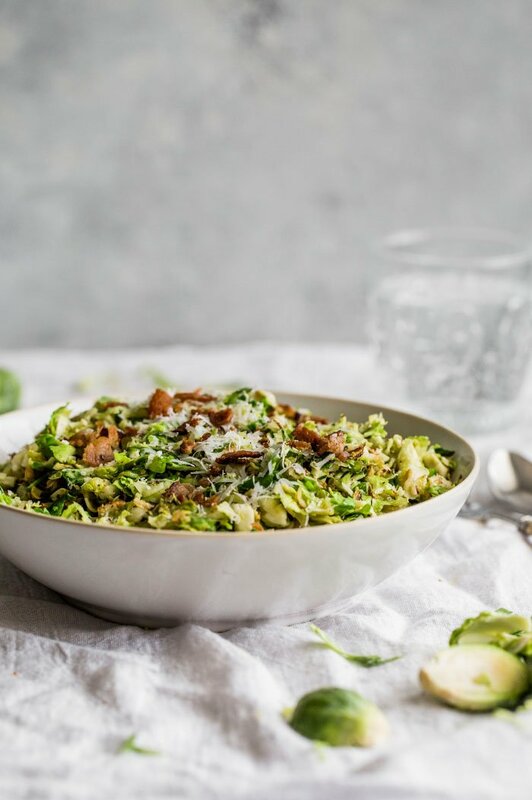 Shredded brussels sprouts salad! 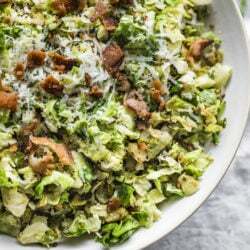 When I initially posted about brussels sprouts (shocking all), many of you chimed in and suggested shredding the sprouts into a salad of sorts. For some crazy reason, this sounded incredibly appetizing to me. And it was fun. Seeing the sprouts go from firm rounds to tiny shreds amused my simple mind. I mean, just look at how cute this is? If I’m being truthful, I must admit that I’ve been eating the original sprouts mixture without the bacon grease or the bacon. Great news, no? I pan roast them with a bit of olive oil and balsamic, salt and pepper, and am good to go. But I must start slowly with a new recipe. So I added one simple slice of bacon and just a tiny bit of cheese – nothing too heavy. Makes a world of difference on these sweet teeth. And then… more bacon and more cheese. I mean, isn’t that how it’s supposed to go? We all know how much I dislike vegetables and this was such a fabulous dish. It could be because I really enjoy chopped salads. Or bacon. Or cheese. Maybe it could just be because it is utterly delicious. Scrumptious. Delectable. 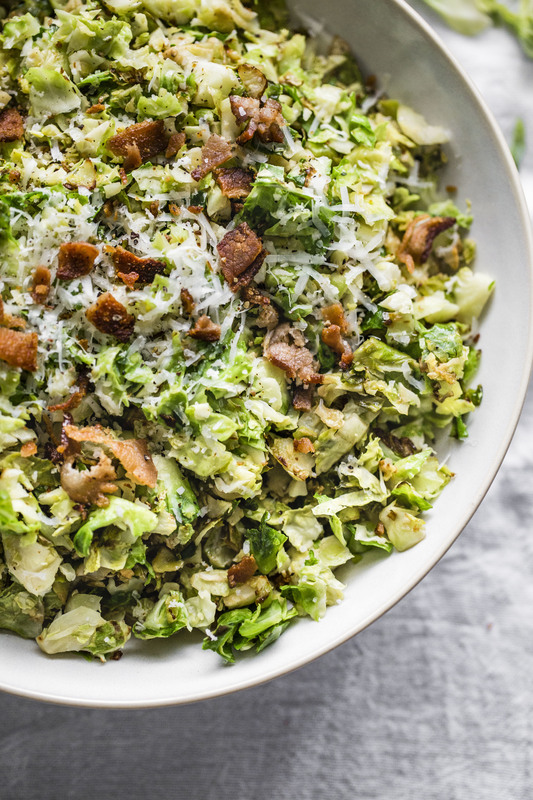 I truly believe that even the biggest veggie-hater (me) would love the shredded brussels sprouts salad. If I love it, you can too! I begin by cutting the stems off of the brussels sprouts – you can do this, or skip this step. Add sprouts to a food processor and pulse until sprouts are tiny shreds. Do it manually so you can control the size of the shreds. You want some larger pieces and you don’t want them to be crumbs! Melt butter in a large skillet over medium heat. Add garlic and shredded sprouts, sprinkle with salt and pepper, and saute for about 5-7 minutes, or until sprouts are browning. Add vinegar while stirring and make sure sprouts are all coated. Saute for another 1-2 minutes. Remove and plate. Top with crumbled bacon and a small sprinkling of asiago cheese. Devour! Can someone please tell me who I am? Because I really don’t know. Brussels sprouts whaaaat?! P.S. -> there is a (tasty!) giveaway going on over at the How Sweet Facebook page. I’m scared now – Jessica, where are you?! I was stuffing my face with blondies last night and you were making shredded sprouts salad?! WHERE HAS MY FRIEND GONE???? I made these tonight, they were soooo good! I’ve basically been OBSESSED with roasted brussel sprouts lately so you basically made my day when I saw this! Thanks for posting!! I never thought about shredding brussel sprouts!!!! Great salad! thanks again for you awesome recipes that you share with us all. Oh my goodness… These look awesome. I just made Brussels sprouts tonight and I considered doing something new but just ended up roasting them. Next time I am making this! This is my favorite recipe everrrr. I’m going to review it on the blog this week!